Vice President Mike Pence greets National Security Advisor Michael Flynn before Japanese Prime Minister Shinzo Abe and U.S. President Donald Trump arrive for their joint news conference at the White House in Washington, Feb. 10, 2017. Trump, speaking at a White House news conference alongside Israeli Prime Minister Benjamin Netanyahu, made no mention of why he forced Flynn's resignation after just 24 days on the job, for what the White House described Tuesday as the president's “eroding trust” in the former Army general. He suggested that officials leaking the documents about Flynn's calls with Russian Ambassador Sergey Kislyak were “trying to cover up for a terrible loss that the Democrats had under Hillary Clinton,” the former U.S. secretary of state Trump defeated in the November election. National security adviser General Michael Flynn delivers a statement daily briefing at the White House in Washington, Feb. 1, 2017. 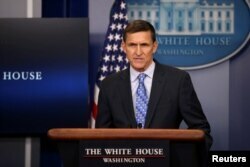 Trump spokesman Sean Spicer said Tuesday that Flynn had misled Vice President Mike Pence and other officials in the weeks before Trump's January 20 inauguration in telling them that he had not talked with Kislyak about sanctions imposed on Moscow by former President Barack Obama in retaliation for Russia's meddling in the presidential election to help Trump win, when U.S. intercepts of their conversations showed that he had. “The real scandal here is that classified information is illegally given out by ‘intelligence’ like candy. Very un-American!” Trump said. He said, “The fake news media is going crazy with their conspiracy theories and blind hatred.” He said two U.S. cable news outlets, MSNBC and CNN, were “unwatchable,” while describing the Trump-friendly talk show “Fox & Friends” as "great." The Post last week was the first newspaper to publish details about the phone conversations between Flynn and the Russian ambassador before Trump took office, while the Times in Wednesday's editions said Trump aides and associates had repeated contacts with senior Russian officials during the 2016 campaign. Obama often rebuked Moscow for its unilateral 2014 annexation of Ukraine's Crimean peninsula and the United States, along with the European Union, imposed sanctions against Russia. But the West did not intervene militarily and Crimea remains under Russian control. Russia dismissed the Times' report that members of Trump's campaign and other associates were in contact with senior Russian intelligence officials before the November U.S. election. Paul Manafort attends a round table discussion on security at Trump Tower in New York, Aug. 17, 2016. Manafort called the accounts “absurd,” the Times said. He also denied a similar CNN report that Trump associates, including Manafort and Flynn, were regularly communicating with Russian nationals before the election. In Moscow, Kremlin spokesman Dmitry Peskov said the report “is not based on any facts,” while Russian media quoted the country's foreign intelligence service saying reports about the contacts were unfounded. 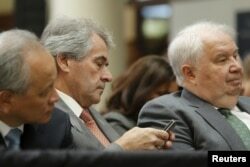 FILE - Russia's Ambassador Sergey Kislyak from right, U.K. Ambassador Peter Westmacott and China's Ambassador Cui Tiankai wait for U.S. President Barack Obama to deliver remarks on a nuclear deal with Iran at American University, Aug. 5, 2015. White House spokesman Spicer said the president and his close advisers had been “reviewing and evaluating” that information on a “daily basis for a few weeks” before Trump forced Flynn's resignation. Pence also said Flynn and Kislyak “did not discuss anything having to do” with the Obama administration's decision in late December to expel dozens of Russian diplomats. The Russians were sent home in response to allegations of Russian cyber-spying against Clinton's campaign chief during the 2016 presidential campaign. 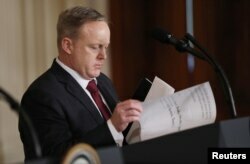 White House Press Secretary Sean Spicer goes through papers on the podium for President Donald Trump before a joint news conference with Israeli Prime Minister Benjamin Netanyahu. Spicer also said the White House decided there was “nothing wrong” that Flynn had talked with the Russian diplomat, even though Flynn was a private citizen at the time. 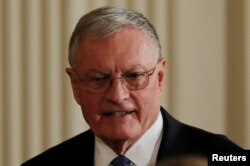 Acting U.S. National Security Advisor Retired General Keith Kellogg arrives for a joint news conference between U.S. President Donald Trump and Israeli Prime Minister Benjamin Netanyahu, Feb. 15, 2017. Also Wednesday, the Trump administration was said to have offered the job to Vice Admiral Robert Harward, two U.S. officials familiar with the matter told Reuters. It was not immediately clear if Harward, a former deputy commander of U.S. Central Command who has Navy SEAL combat experience, had accepted the offer, the sources told Reuters.